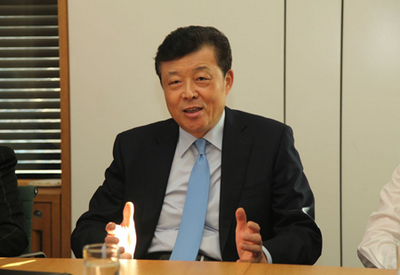 On 2 March, Ambassador Liu Xiaoming attended the round-table discussion held by APPCG at the Portcullis House of the UK Parliament. 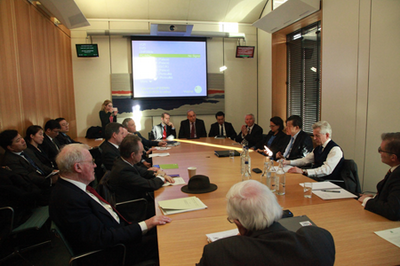 Chairman of APPCG Richard Graham and over 20 MPs and peers were present. Ambassador Liu said that China attaches great importance to the significant role of British Parliament in the development of China-UK relations. He expressed appreciation to APPCG for its positive contribution to promoting the parliamentary exchanges and bilateral cooperation as a whole. He hoped that, starting from the first year of the "Golden Era", China and the UK would work together to implement the outcomes of President Xi Jinping's visit, promote practical cooperation in all fields, enhance communication and coordination in international affairs, and strengthen parliamentary exchanges between the two countries to deepen mutual understandings. China welcomes more British MPs to visit China, and hopes APPCG will make new and greater contribution to the development of China-UK relations in the coming year. Chairman Richard Graham and other MPs and peers emphasized APPCG's commitment to facilitating the Global Comprehensive Strategic Partnership for the 21st Century and promoting extensive cooperation between the two countries in a wide range of areas such as people-to-people contact and environmental protection. APPCG is planning to arrange for more than 100 MPs and peers to visit China in the coming four years to obtain first-hand information about the changes in China and the progress in China-UK cooperation in various areas. APPCG is willing to make joint efforts with China to contribute to the "Golden Era" of China-UK relations. Ambassador Liu also answered questions from MPs and peers on China-UK steel and iron trade, bilateral cultural and educational exchanges, animal protection, Hong Kong, Taiwan, North Korean, South China Sea, and anti-corruption. Ambassador Liu briefed them on the comprehensive achievements of the mutually beneficial and win-win cooperation between China and the UK, and clarified China's position on issues where doubts exist. He emphasized China's is committment to peaceful development and to maintaining peace and stability with neighbouring countries; to "one country, two systems" and Hong Kong's prosperity and stability; and to promoting peace and facilitating talks in the solution of regional hot-spot issues. The MPs and peers appreciated the face-to-face communication with Ambassador Liu, saying that straight-forward and candid discussion was beneficial to both sides. At the end of the round-table discussion, the hosts banged the table to express their gratitude and respect to Ambassador Liu.